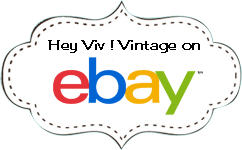 Vintage Bracelets are Charming - Hey Viv ! Ok, so that title is a bad pun. But I really do love vintage bracelets and of course my favorites are Charm Bracelets. It's hard not to keep them all but I've bitten the bullet and listed some on eBay. I also had fun with Instagram this week and created posts that featured bracelets like this Sarah Coventry Bicentennial Charm Bracelet. Remember 1976 and all the hoopla ? It was Bicentennial Fever and everything was patriotic. Only 8 more years til the next Anniversary America! side note - while I was writing this post this bracelet sold :) Got to Love eBay !